Estoi is a charming little town located at the foothills of the Serra do Caldeirao in the southern region of Algarve. Only 10 kilometres north of Faro itself it is situated the district of Faro and has about 3,000 residents, from locals to retired expats, all of whom enjoy a typically relaxed Portuguese lifestyle. Dating back to the Roman era, Estoi is filled with whitewashed houses, cobbled streets, and a main square in the centre which was completely refurbished in 2008 and is now surrounded by cosy little cafes, bars, and restaurants. The town’s most notable church is found in main square and is an interesting mixture of architectural designs from the Corinthian columns at the main entrance to the Moorish style bell tower. At the bottom of the steps leading into the church is an ancient stone trough filled with spring water that flows from three stone pipes. The other smaller squares in town are perhaps more reflective of the period when Estoi was occupied by the Moors. There are many beautiful merchant’s houses throughout the town, each with impressive carved doorways and romantic style balconies. 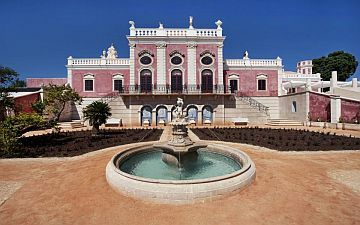 However, Estoi’s most impressive building is the Palacio de Estoi, nicknamed the Pink Palace. The palace was built in the 18th century and is an excellent example of Neo-classical architecture. It was commissioned by the Carvalhal family and has more of a French/Italian style interior. It was eventually sold to a wealthy chemist from Beja, and the Carvalhal family left the proceeds of the sale in their will to all the poor in the area. The new owner did such an magnificent job of restoring it that he actually earned the title, Viscount of Estoi. 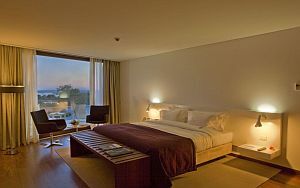 Today the palace is now the luxury Pousada Estoi offering its guests excellent cuisine and superb facilities, such as a Spa and both indoor and outdoor swimming pools. Within the grounds of the palace is a botanical garden that is open to the public as well as guests of the Pousada. Just beyond the palace walls is another rather interesting building. Formerly an old laundry house, it has a hand painted tiled roof that has recently been restored. Without a doubt the town’s main attraction is the Milreu Roman ruins drawing in thousands of tourists each year, and although the site is rather small it does have a very informative visitors centre. Dating back to 1AD it started out as an agricultural settlement and over the centuries has changed use five times. In 3AD it was transformed into a luxury Roman villa that included a small complex of roman baths. The following century it was turned into a pagan sanctuary, and later the sanctuary was converted into a Christian church. During the Middle Ages it became an oratory until it was eventually abandoned, and three hundred years later the original Roman ruins were incorporated into the architecture of a farmhouse. Estoi becomes a hive of activity every second Sunday of the month as this is when they hold a large farmer and gypsy market on the outskirts of town. Here you can buy everything from ham, cheese, or olive oil to horses and poultry. The town also hosts two fairs each year. A rather special Horse Fair is held in August with equestrian displays and bull fighting. The second celebration is the Festa da Pinha in May with a spectacular display of fireworks, as well as a procession of horse-drawn carriages and riders on horseback all carrying torches. Both these events are very entertaining and would definitely make your visit all the more memorable.